Amazing Buy-to-Let offer! Similar apartments bring up to 8% annual income. Our UK-based rental partners will be delighted to rent it out for you. You focus on investment and the purchase, and the company will take care of the rest. Two-bedroom ground floor apartment with spacious terrace is located in a seaside residential complex "Palm Bay View", which stands on the highland in just 150 m from the sea. Apartment is fully furnished and equipped, ready to move-in. In front of the apartment there is a spacious terrace with amazing views of the sea side. 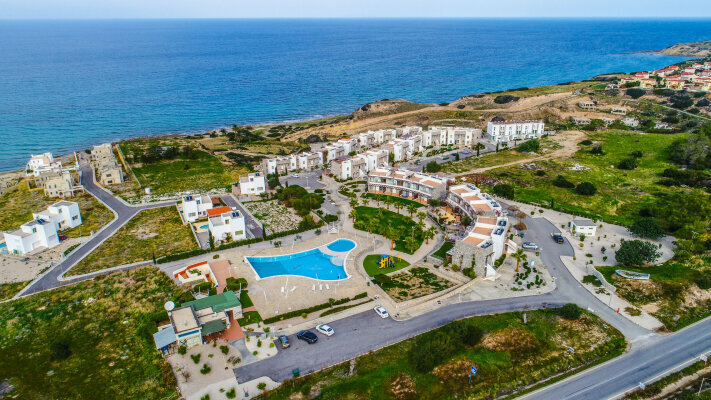 Complex is only 20-minutes drive from Kyrenia. On the coastal road you will find absoluterly everything for comfortable living or vacation: shops, supermarkets, beach bars, etc. Nearest supermarket is only 5-minutes drive.